My wife is an avid book reader. Not the digital type though. She says there’s something special about actually feeling the book and manually flipping pages that you don’t get with the digital versions on tablets these days. And because of that she has quite a collection of books. If you’ve been following my content for a while you may remember that I already made her a bookcase a year or two ago. Unfortunately that bookcase was overflowing the day I completed it. She’s always had a lot more books than we’ve had space for. So this time my game plan was to make two very tall bookcases that would hopefully provide enough book storage space for the next year or so. I was wrong again. She filled both of them up the day we put them in the room. “Bookcases” refuses to get scratched off the To-Do list. These bookcases were built for our guest room which features the bunk bed I made a few months back. This isn’t the room you saw at the end of the bunk bed video though. We moved it to the other spare room in our house as it has much more natural light. 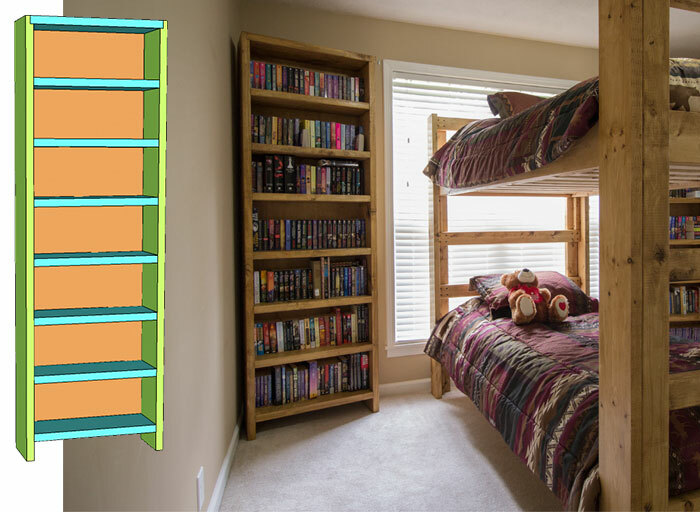 I wanted the bookcases to fit the dimensional lumber theme of the 2×4 and 2×6 bunk bed so I used 2x10x8 boards. I let the material rest on stickers in my shop for a few days before I started this project. The first step was to determine the straightest four boards for the sides. 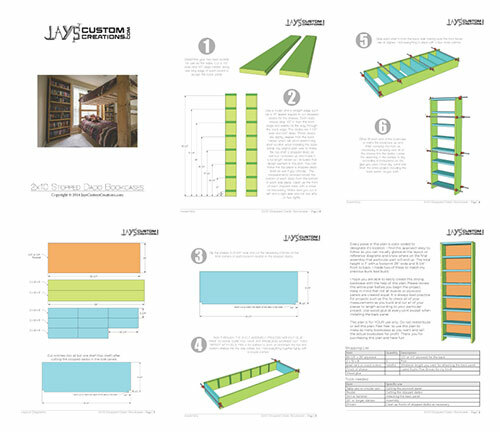 For those interested in the convenience, I have a detailed set of plans available for this bookcase project at the bottom of this article. UPDATE: This is one piece of an entire bedroom set. If you are interested in plans for the entire set CLICK HERE. The back panel of the bookcases will be inset on the sides. This would have been super quick to do with the table saw but because the boards aren’t exactly straight and they are a full eight feet long I doubt I would have gotten a consistent rabbet with a dado blade. So instead I used my laminate router with a downcut spiral bit, the edge guide, and a hot-glued shopvac attachment for dust collection. This worked great in three passes. After making the rabbets for the back panels I squared up one end and cut each side board to length on my miter saw. I say it a lot but having a dedicated miter saw station is and incredible convenience to have. I absolutely HATE using a router without dust collection. And I’m sure most everyone out there feels the same way. Two bookcases with two side boards each and eight shelves each means 32 dados that are 1-1/2” wide, about 5/8” deep, and about 8” long. That’s a ton of sawdust. 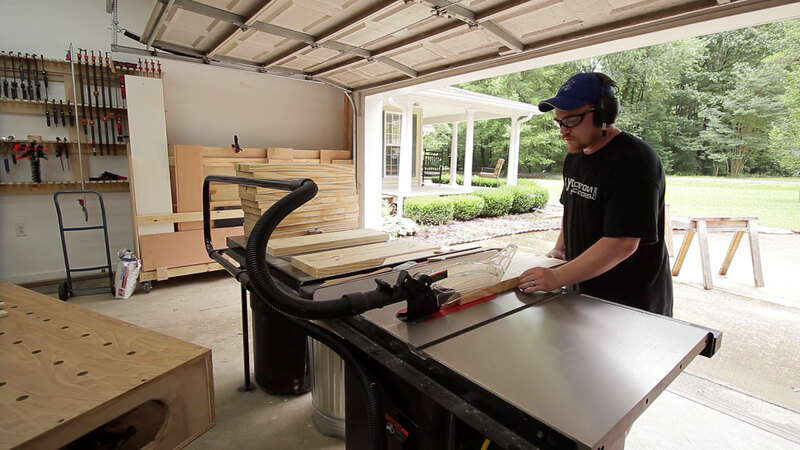 So after two dados in the shop I decided to move the operation outside. I didn’t want the dados to be visible from the front of the bookcase so I chose stopped dados. They stoped about a half inch from the front edge. All but the very top dado, which was actually a rabbet. I accidentally screwed up and blew through the front on one of them so both bookcases ended up getting a rabbet on the top edge instead of a stopped rabbet. Oh well. Cutting these took forever. Right after I finished the dados a storm blew through so I called it quits for the day. It’s annoying trying to record a video when there is thunder in the background. The next day I started by cleaning up the dados a bit with a chisel. I didn’t worry about squaring up the rounded corners of the dado as they would be covered anyway. 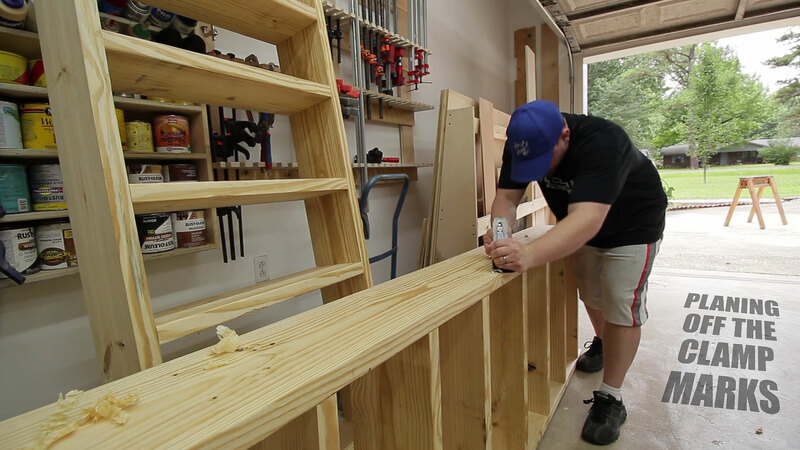 Next up was to cut all the shelves to length. There are a lot of shelf boards here. But again, having a dedicated miter saw station with a stop block made quick work of the process. The shelves needed to be ripped to the appropriate width to fit inside the back panel and be flush with the front of the sides. Another quick process. This time on the table saw. Here you can see the notch that needs to be made in the front corners of every shelf except the top. 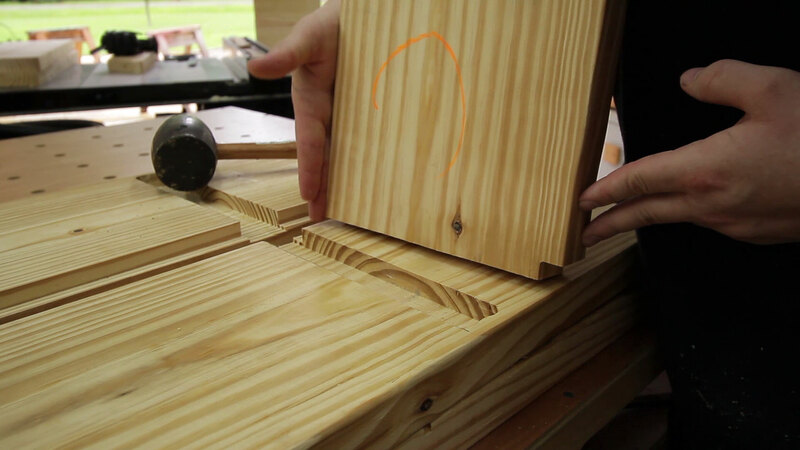 The notch needs to be as deep as the dado and wide enough to clear the rounded corners left by the router. And that notch is made at the table saw with my miter gauge. I used a sacrificial piece of plywood screwed to my miter gauge to help keep the shelf stable as I made the cuts. The plywood also acts as a push shoe to push the waste block past the blade. 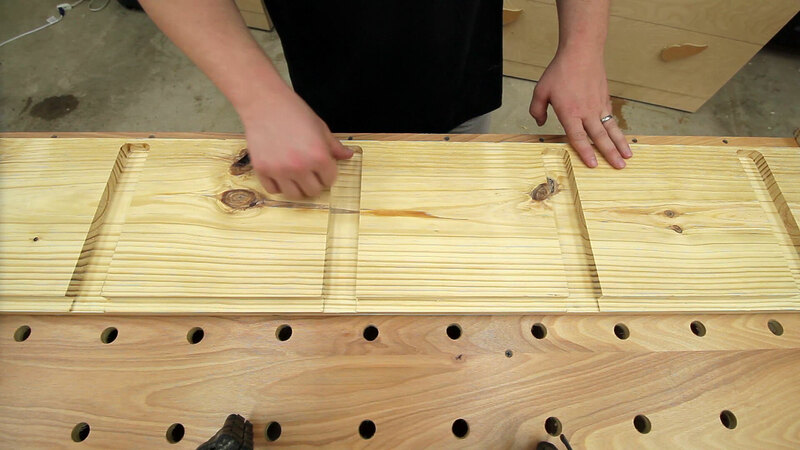 The fence and blade are setup so that the notch can be made by making a horizontal and vertical pass with the shelf. Assembly was a bit crazy. I couldn’t find any extended cure wood glue at my local Lowes so I just used Tightbond III and went as fast as I could. It was extremely warm in the shop which makes glue setup pretty quick. 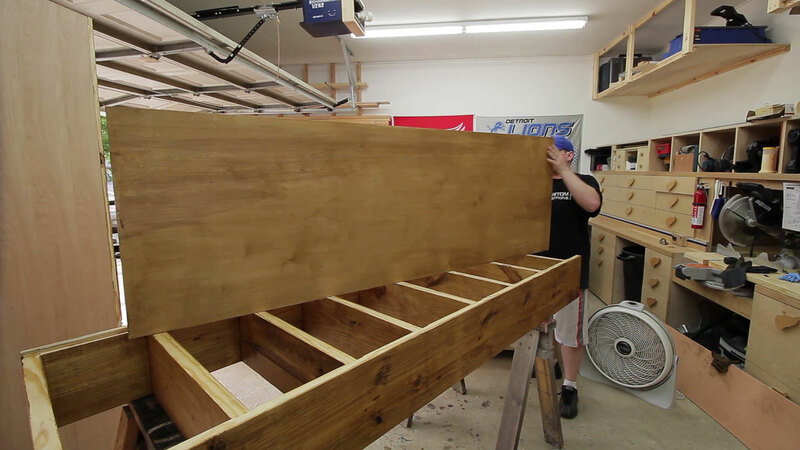 I started with gluing and inserting the top and bottom shelves and holding them in place with a couple clamps. This would keep the side panels where they need to be as I glued and beat the remaining shelves in place with a rubber mallet. And when I say I beat them in place I’m not kidding. Some of these took quite a bit of force to get them to move. 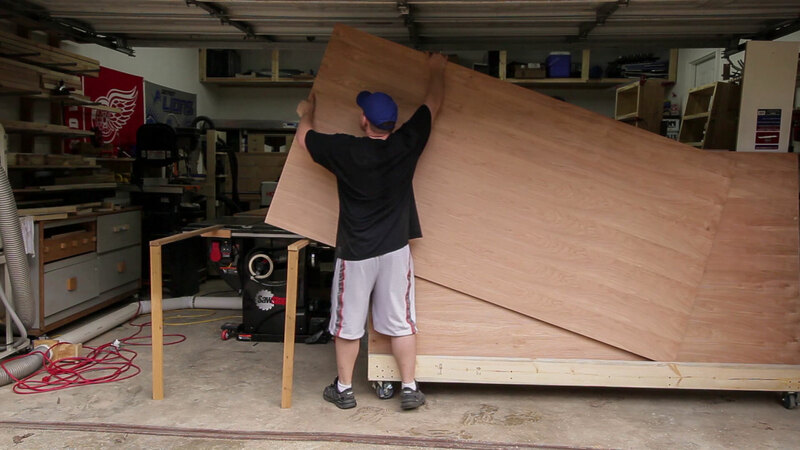 Making large warped boards fit into straight dados is tough. With the shelves in place I stood the bookcase upright and used all the long clamps I had left to pull the sides in as needed. I didn’t have enough long clamps to do both bookcases at the same time so I waited about an hour before gluing up the second case. For the back panel I cut some Purebond hardwood plywood. It’s made in the USA and formaldehyde free which are both things I love. 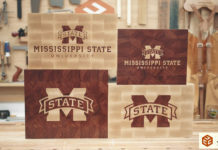 I seriously like this plywood. Because of the distance I have to drive to get it I like to get it in bulk and keep it on hand to use. This batch has been in my shop for a couple months now and it hasn’t warped which is almost impossible with lower quality pine plywood. 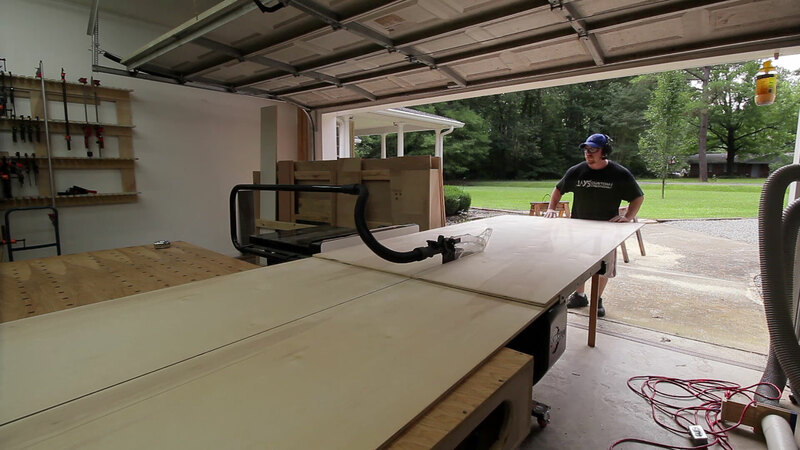 One of the advantages of the rolling plywood cart I made to hold all of the plywood is that I can roll the cart right next to the saw, place one corner of the plywood onto my table saw infeed support arms, lift the other side of the plywood and feed it through the saw all without bending over. 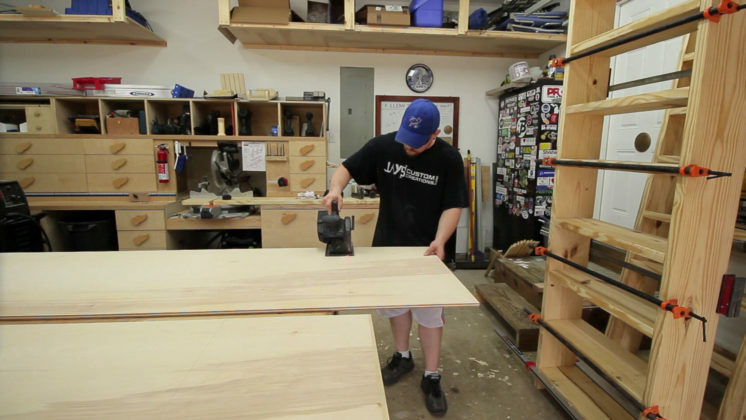 Outfeed tables are typically just shy of the height of the table saw. I made mine to be a full 3/4” lower than the table saw. I find this to be beneficial in two areas. 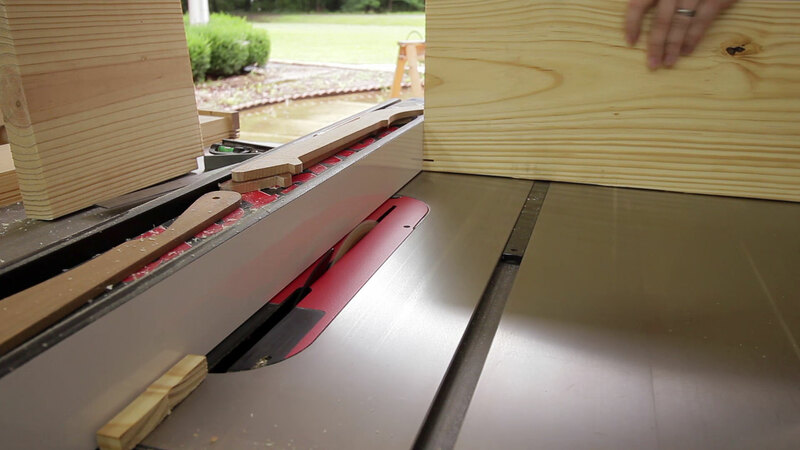 One, it allows the runners of sleds to clear the surface of the outfeed table without the need to route grooves. This is beneficial if your outfeed table isn’t always used as an outfeed table, as is the case with mine. Another benefit is that you can rip two sheets of plywood down and have the material stack before needing to clear the table. 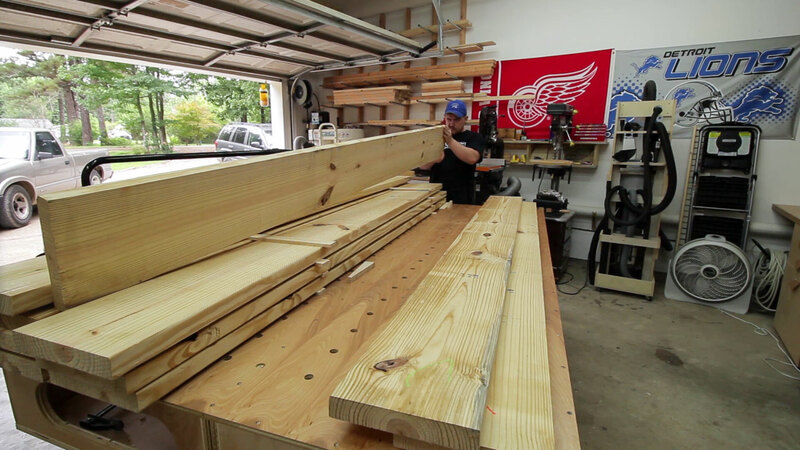 The bookcases aren’t quite 8′ tall so the back panels need to be cut down a little. I used my battery powered circular saw for this. This is another tool that I’ve grown to hate using due to the lack of dust collection. In the winter time it’s not too bad but when you’re already dripping with sweat due to the heat of summer having sawdust thrown all over you is not a pleasant experience. My wife purchased the furniture set we have in our bedroom before I got back into woodworking. 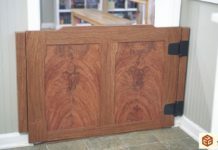 That was about four or so years ago and that furniture is pine with a hand waxed finish. Just wax, that’s it. I really like the way the waxed furniture feels so I’m using just a wax finish on these bookcases. 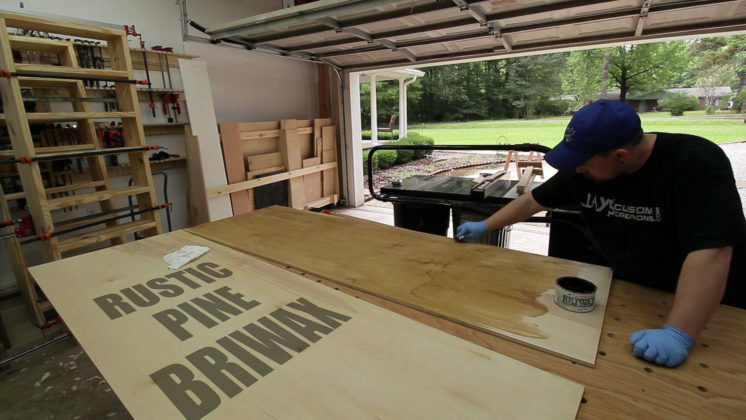 It’s Rustic Pine Briwax. 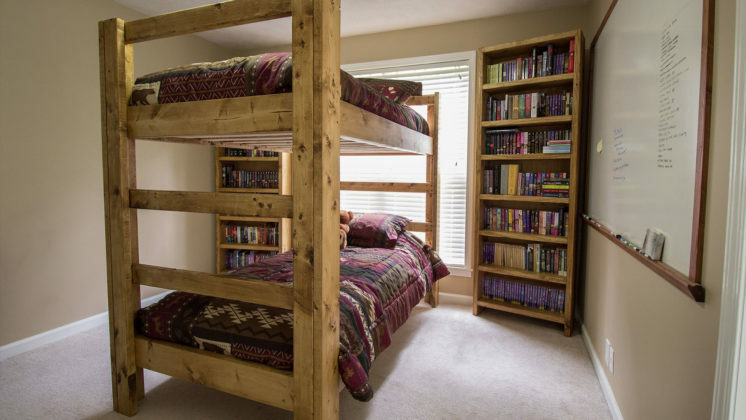 The same finish I used on my bunk bed and I absolutely love it. It’s also incredibly quick to apply. I did the back panels first. After the side panels had cured I used my hand plane to remove the marks left by the clamps. This could have been avoided by using some sacrificial clamp blocks during the glue-up but I was in such a rush that I didn’t even think about it. After scraping off any manufacturing stamps on the solid pine I applied a coat of wax to every surface that would be visible on the bookcase. Then it was time to apply the back. Here you can see how nice the wax finish looks on the back panel. I secured both back panels with a couple washer head screws. These bookcases are tall and somewhat wide. Because of which I thought it would be a little difficult to maneuver them through our hallway and into the bedroom so I put them through the window instead. This actually worked out great. It saved quite a bit of carry distance. Just as I put them in place my wife filled them up. And I’m not kidding when I say they are full. She actually has more books that still need a place to go. 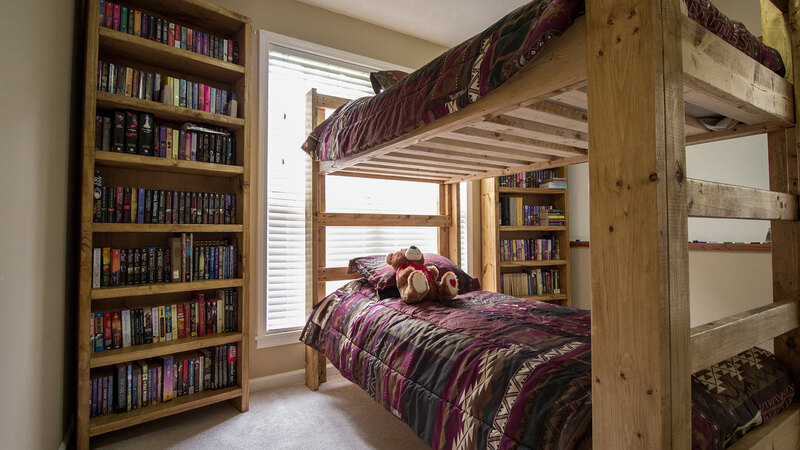 These bookcases are one of a few more projects I will be making out of dimensional lumber to match this bedroom. Stay tuned as a chest of drawers will be next. 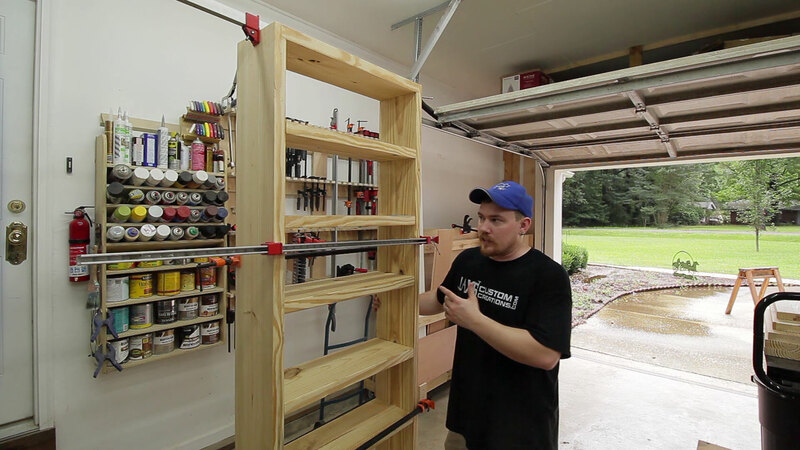 These bookcases are pretty easy and straight forward to make. However, on most all of my simple builds I still get requests for plans. So with these I do have a set of plans available below for these bookcases for those who are interested. Thanks for stopping by folks. Have a good one! Awesome job, Jay! 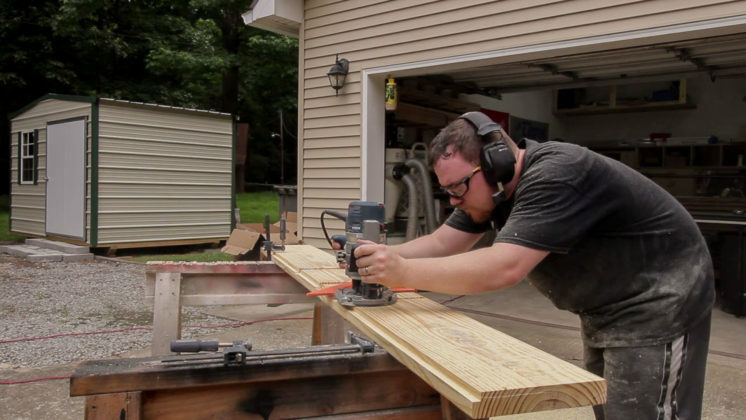 I think that’s the first time I’ve seen you use a hand plane in any of your videos. I think I’ve seen you make use of that speed square more than any other tool. Definitely a very versatile tool. 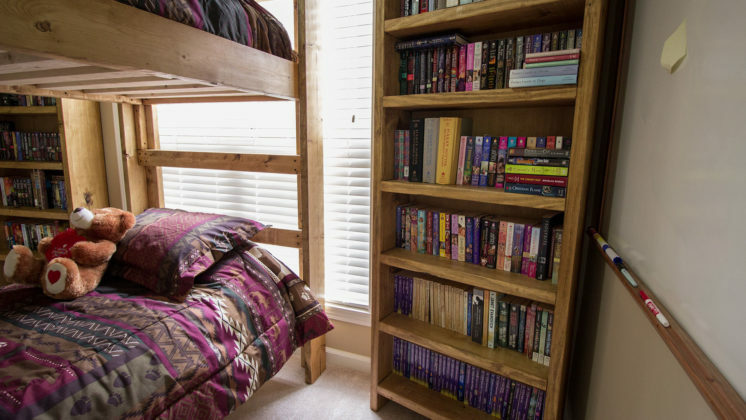 Did you have to attach the bookcase to the wall to keep it from tipping? I can’t imagine how heavy those things are. You made carrying them look easy. The speed square is definitely handy. I use the hand plane more often than what most people think. Great job on the book cases, Jay. I agree with joshual1177, I don’t remember seeing you using a hand plane in the past either. My wife is an avid reader also, but I do see a problem with your case project. You’re going to need a third one since both of them are already full. Or maybe you could tell your wife about a recycle book store, if there’s one in you area, it could help with that problem. But then again we have 10 shelves and 3 cabinets full of books in our house. Oh BTW I am going to have to try the trim router trick with the hot glue and vac-hose. Thanks! The shopvac hose thing really made a big difference. I plan on converting the other spare room in our house to a library/office for the both of us so at that point she will have an entire wall of built in bookshelves. If at that point she doesn’t have enough shelf space then it’s time to give away some books!! Hello Jay. I have the same Bosch 1617EVS router. In regards to the dust, I highly recommend you get the dust extraction kit. I am very impressed with its ability to extract the dust. (http://amzn.to/1I75tvQ). Thanks! I might look into that. That is only a problem when the trapped piece is left between the fence and the blade. I explained in the video that the offcut is being pushed passed the blade before I return the miter gauge. Very nicely done; well planned & executed. 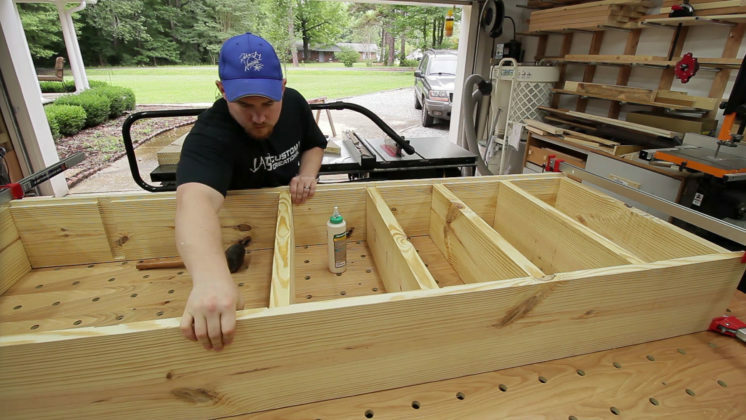 Using dimensional lumber is a great way to save the $. Looking forward to more of your excellent work. I didn’t start wearing hearing protection until I got my current dust collector as it’s just way too loud. Now I’ve gotten used to them and don’t know how I didn’t go crazy without them. Good video for bookcases. I like the Briwax finish and will try it on a table I’m currently making. I’ve always been stuck with bottom bunk. 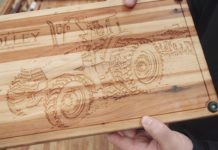 Another great project post, Jay! Those bookshelves really look heavy. Hopefully you anchored them to wall at top to avoid tipover (small kids might see as ladder on a pirate ship.) ;-) I know mine would have when younger. Thanks for sharing! Just got a request from my wife to build a bookshelf and chest of drawers. Your timing is uncanny. Cool that you snuck your wife into the video. She didn’t bring you any chips while the glue was drying though. lol. I made sure to get a letter of approval from the boss lady to include her in the video. Hope you are able to make an awesome set for your wife! If you have the potential of them being knocked over, yes. Great work Jay! Keep up the good work. Thanks Dylan. I appreciate it. Nice build Jay. The two bookcases turned out really nice. Thanks for sharing your talents. You are greatly appreciated. Hey Jay it looks great can’t wait to see you in Kansas City at the convention I looked for a like button to hit on this particular post but couldn’t find it. Hi Jay…nice build! When did the Grizzly table saw get replaced with a SawStop? Are you going to review the new saw at some point? Back in May. I might do an article on it in the future. I am not fluent in cutting dados with a router so forgive the dumb question I am about to ask. 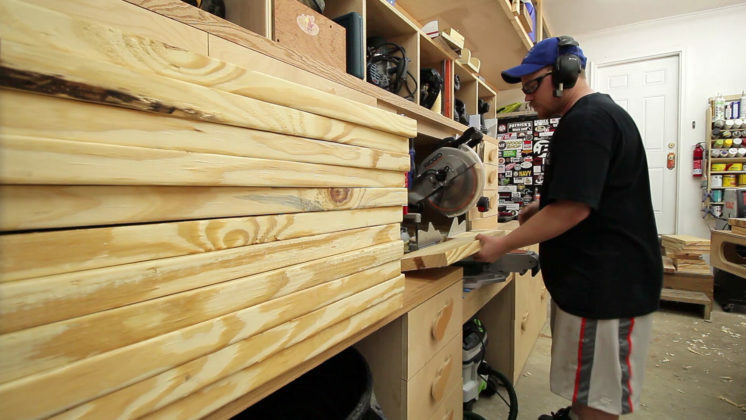 How can I ensure that while cutting the dados for the shelves that I stop at 1/2 inch from the end? I thought that maybe I could another 2×10 up against the one I am cutting on and place some type of stop-block on it to make sure I stop at the precise place. What are your thoughts? You stop pushing where you don’t want it to go. I just eyeballed it to stop close to 1/2″ away from the ends. 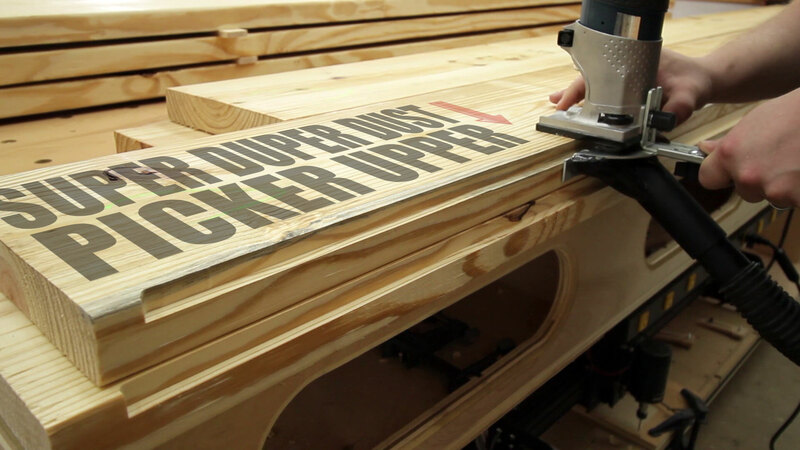 Or draw a line where you want to stop and only push the router to the line. Then clean it up with a chisel. Attractive, Functional,Simple, and Sturdy. I’m Impressed, and like your style. I wonder if leaving the pith in will have any adverse effects over time? Awesome bookcase! I could use this post as a basis for my upcoming bookshelf project. I own a few books myself and have the same thinking about books just like your wife. I think there is something special in feeling the pages as you turn each page compared when you use a tablet. That is a huge bookshelf! My kids would probably climb on top of each shelf! We have a similar bookshelf (a bit smaller, though) at home and we needed to screw it against the wall so to avoid falling on top of the kids. My husband is contemplating on creating a bigger bookshelf for us because our old one is much too small for our collection. How long did it take for you to finish sawing the panels? 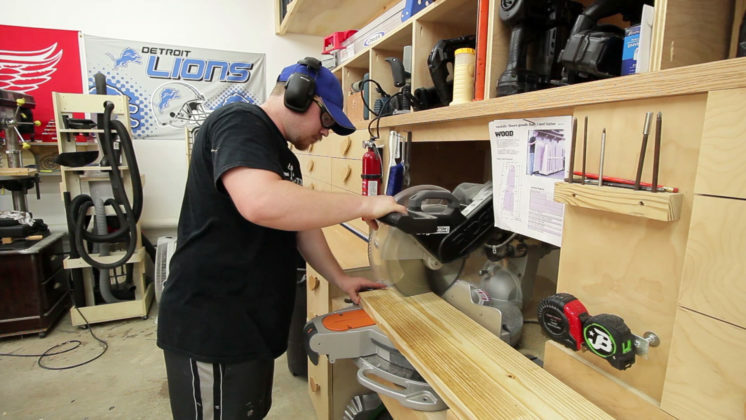 Lucky you, you have a huge outdoor facility so sawdust will not accumulate. If there’s one thing I hated about my husband’s woodwork that would be the aftermath of the wood trimmings and sawdust!